At whyrHymer we are always listening for ways to harmonize the functions of a table with designs that ask us to admire them as much as we rely on them. All tables can be customized to the size requirements you need. We are always open to custom options or all new designs as well. whyrHymer offers many custom options and configurations for our lighting. Stop by our Los Angeles showroom to see many examples of just how transformative lighting can be. We are always open to custom options or all new designs as well. There is no greater challenging aspect of furniture design and construction than seating. We all come in different shapes and sizes and designing for all is the goal we set for our selves. We are always open to custom options or all new designs as well. We're not only into making furniture and lighting! Whether it's a cutting board, mirror or showcasing another makers talent, we strive to bring you a unique collection of well designed and interesting objects. 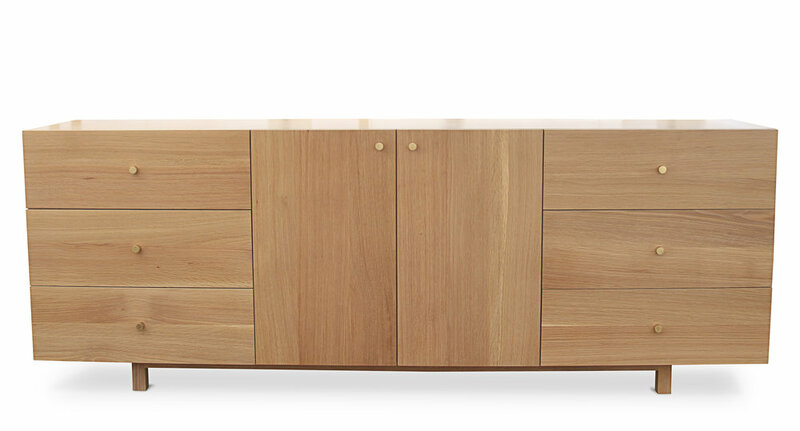 Cabinets are an integral part of our lives at home and at work. At whyrHymer the idea is to achieve functional harmony with design that draws the eye and anchors a room. We are always open to custom options or all new designs as well. The evolution of the desk has been unfolding along with the technology we use it in service of. Our computers are smaller and smarter allowing for less clutter. Less is more. We are always open to custom options or all new designs as well. Any object is instantly set apart from it's surroundings by how well it's made and how it feels. Neither of these are possible without fine materials and methods. In this collection you will find your available choices for wood, glass, metal and upholstery.